favorit Song on Greys Anatomy?? 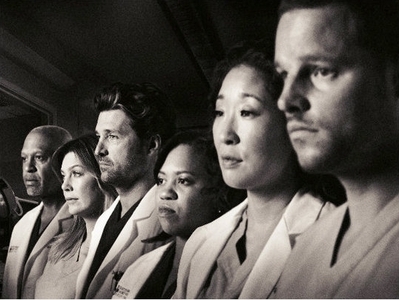 So we all know how much of an impact musik has on grey's. So what are your favorit songs and what episodes were they in?? Chasing Cars oleh Snow Patrol! Evrytime I hear that song i think of Grey's Anatomy!! That's my favorite, too. I just cinta it sooo much and it reminds me of Grey's. xd And I cinta Taylor Swift-White Horse. same. season 2 ending was greys high point in my opinion. best. The show's main judul theme during its first two seasons is an excerpt of "Cosy in the Rocket", oleh British artist Psapp. The Postal Service "Such Great Heights"
Maria Taylor "Song Beneath the Song"
Tegan and Sara "Where Does the Good Go?" Mike Doughty "Looking at the World from the Bottom of a Well"
The Eames Era "Could be Anything"
Rilo Kiley "Portions for Foxes"
Medeski, Martin & Wood "End of the World Party"
The Ditty Bops "There's a Girl"
The Radio "Whatever Gets anda Through Today"
Inara George "Fools in Love"
Psapp "Cosy in the Rocket"
Thirteen senses "Into the fire"
Jim Noir "I Me You"
Gran Bel Fisher "Bound oleh Love"
Snow Patrol "Chasing Cars" [acoustic version] The iTunes version of the album also includes Sing-Sing's "Come, Sing Me a Song" as the sixteenth track. Peter, Bjorn & John "Young Folks"
The Bird and the Bee "Again & Again"
The Jealous Girlfriends "Something in the Water"
Patrick Watson "The Great Escape"
Bill Ricchini "A Cold Wind Will Blow Through Your Door"
Grace Potter & The Nocturnals "Falling atau Flying"
Yesus Jackson "Running On Sunshine"
Robert Randolph & the Family Band "Ain't Nothing Wrong With That"
Mat Kearney "Breathe In, Breathe Out"
John Legend "Sun Comes Up"
I think In My Veins oleh Andrew Belle atau Somewhere Only We Know oleh Keane. Grey's has great musical moments..
the walking sleep it was in season 8 episode 3 . Christina was opperating on a appy , so was teddy but they forgot and the nurse walked them through it HAHAHA that was hiliaious!